Note: This post is the first in a new series titled Chengdu Stories wherein we interview the people who make Chengdu what it is. 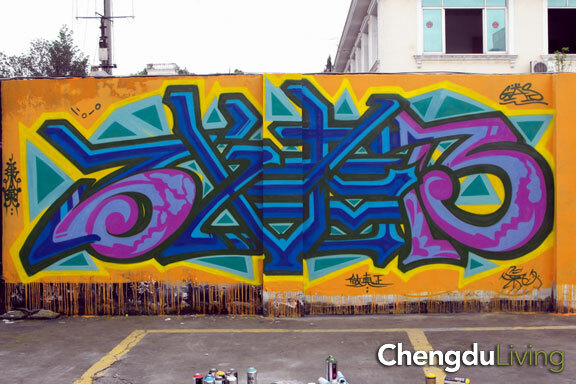 Be they artists, musicians, or proprietors of local establishments we visit weekly, we’ll use this space to share the story of those who’ve left an indelible mark on Chengdu’s local culture. 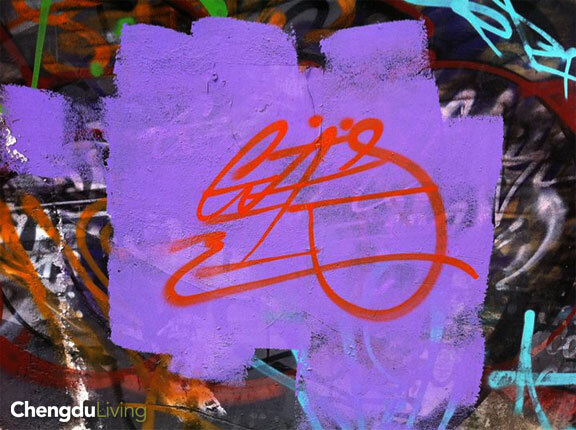 When I was in high school in Washington D.C., I knew graffiti artists who would endlessly sketch their alias’ in notebooks during class, eventually graduating to spray paint and the quiet streets of the nation’s capital. I thought for sure I had left this culture behind when arriving in Chengdu but was shocked and excited to find that I was wrong. 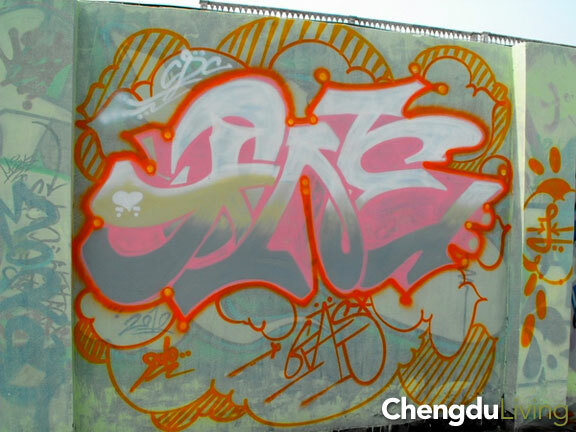 For over a year now I’ve been noticing a graffiti tag posted all around Chengdu. It’s not the first I’ve seen a tag in the city by any means, but two qualities about it made it impossible for me to forget: its sheer abundance and its unmistakable artistry. It’s simple, ever-present, and beautiful. 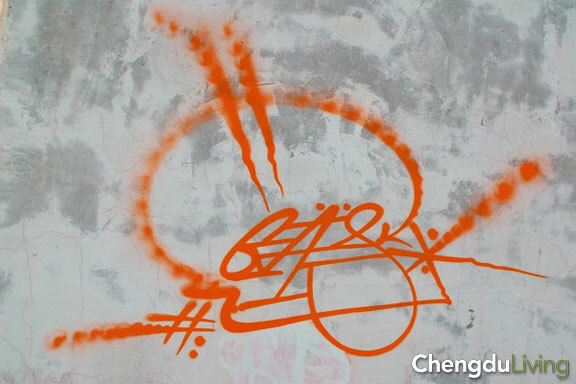 Just three letters: G-A-S.
After noticing Gas and his tag literally proliferate around me and the places where I pass time in Chengdu, I pledged to make an effort to track him down. I was compelled and fascinated by what kind of figure was behind this. With a little help from a friend (thanks Eli), I connected the dots and interviewed GAS. 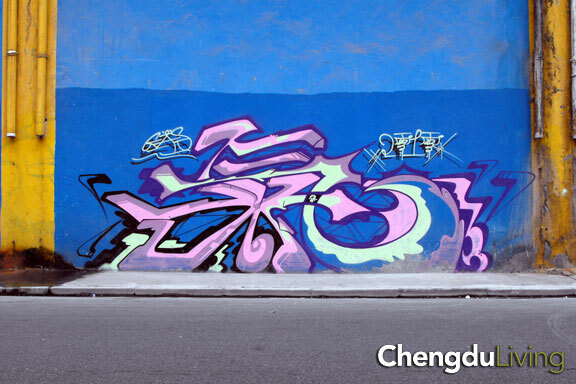 Following the interview you’ll find a collection of street art created by Gas in and around Chengdu. Chengdu Living: How long have you been an artist? Chengdu Living: How old are you now? 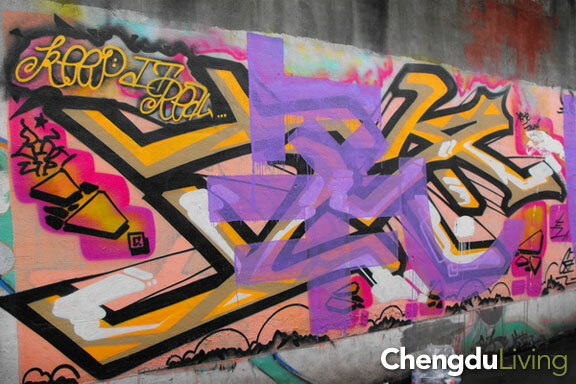 Chengdu Living: How do you see the situation toward graffiti improving in Chengdu? Chengdu Living: How did you get to do that? 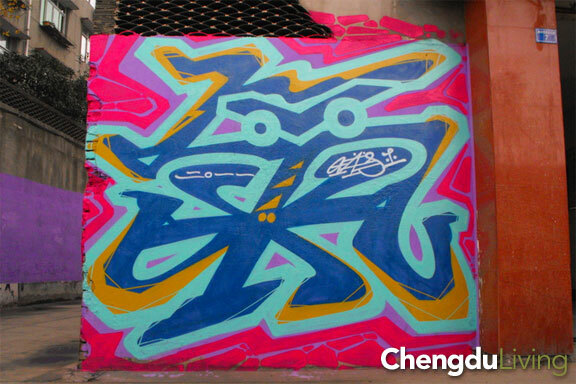 Chengdu Living: How did you get started in graffiti? Gas: “When I first started I thought it was really tough to use aerosol, but I was interested in it, so I kept practicing. Now I have a decent control with spray cans. I try to find flow, the rhythm. Having the right color scheme affects the way that people feel about your piece. The relationship between the colors, the relationship between the composition and the wall, the wall and the surrounding environment. It’s all connected. If you’re just starting, I reccommend you do this. Start with A, B, C and work your way up to Z. Make them look good. Even for Chinese writers, they need to perform this well before they’re ready to move onto Chinese characters which are more visually complex. Hong kong has an influential writer named Xeme. He writes in traditional and simplified characters. He has a ton of style, check him out. Chengdu Living: Are you a member of a crew? Gas: “I’m not part of a crew. I’m completely independent. If I join a crew, they want to control me. They tell me what to write and what not to write. Like bombing – they won’t allow it. It’s not that they are afraid of bombing – they all got busted many times – they just want to take a more commercial route. I think that’s ok, as long as you are respecting the roots of the culture, but I’m trying to promote graffiti in a systematic way. 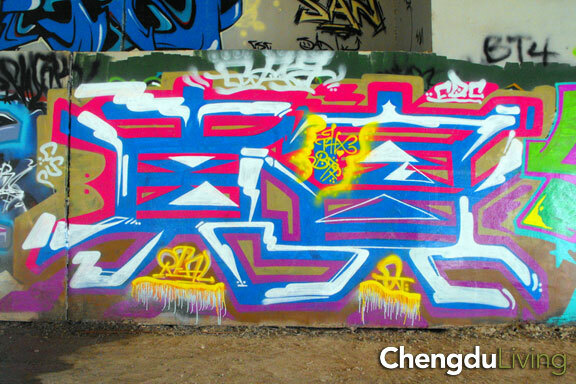 My previous crews tag was OCT. Oct = our city, or CTU, the airport code for Chengdu. 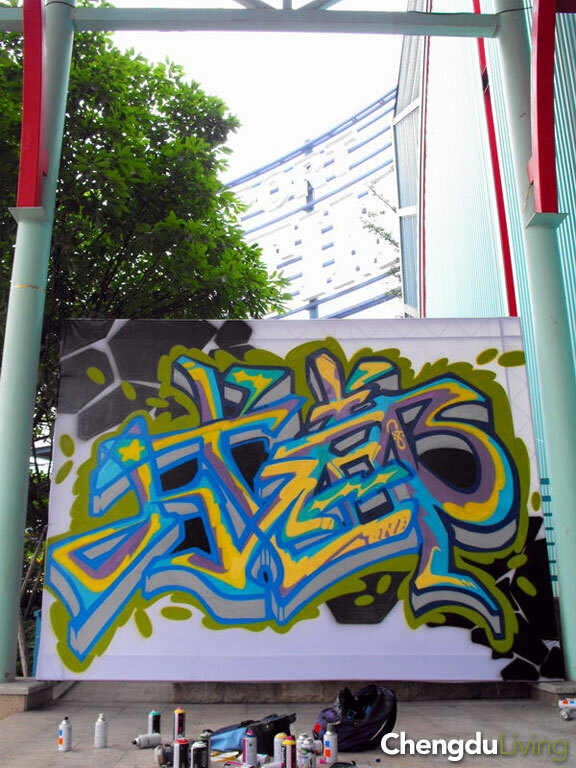 If you see this tag in Chengdu, it’s definitely mine. I paint a lot, and I have never been busted. 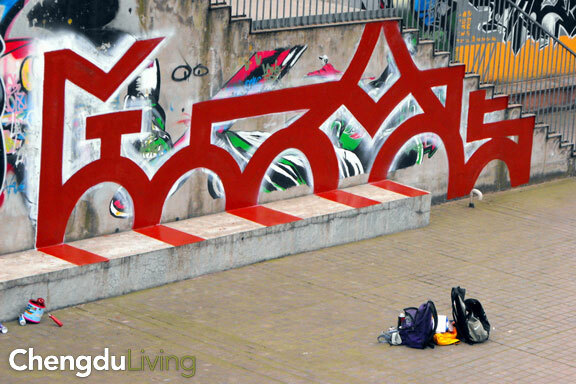 Chengdu Living: What are your goals for your graffiti? 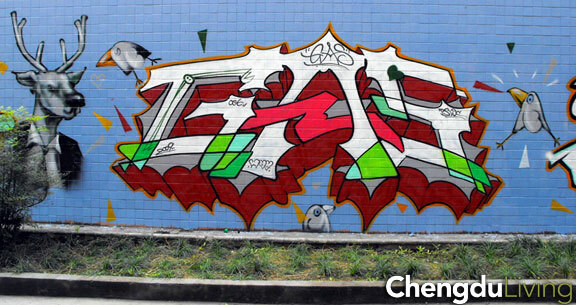 Gas: “To give people on the street art to enjoy. Taking pictures of graffiti and putting them online is cool, but that’s not what I’m all about. 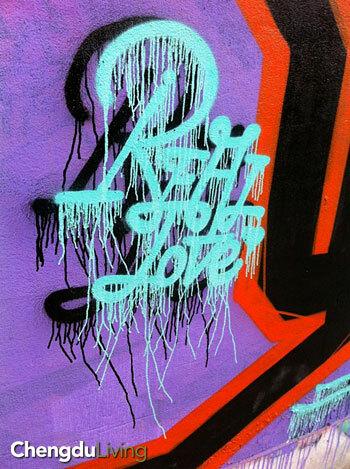 I don’t write graffiti to collect the pictures, the goal for me is to put it on display in the street. Some people just paint in the small alleys. That’s fine, but not a lot of people are going to see it. Some people have a lot of excuses, I’m tired of the excuses. I’ve been hearing them for 5 years. I want to paint on big streets. I want to find big streets to put my art on, big corners, noticeable places. Take it to the streets. Really I would like to paint on trains. But I gotta be realistic. You gotta start with the tagging, and work up to the bombing. Systematically. Chengdu Living: Who are your influences? Chengdu Living: Where can we find you online? Gas: “There is one more thing I would like to say. 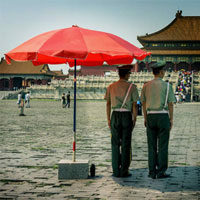 China is a harmonious society. I have a big brother- a brother named HuJinTao, and I will always be loyal to him. I have another big brother named WenJiaBao. I believe in their policies. Even though some people might think that they are wrong, I think in this era, they’re doing a good job. Special thanks to Eli for not only making the introduction, but conducting, translating and transcribing the interview along with me. The interview was recorded in Chinese and we played it back in another session, translating and transcribing at the same time. Thanks of course goes to Gas for participating in this interview and providing images to share. 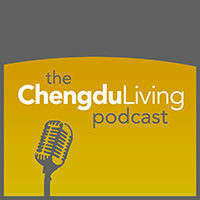 We’re looking forward to upcoming interviews with other Chengdu personalities. If you have a suggestion for someone who’d make an interesting candidate, go ahead and send us a message and let us know! I added some more images, below. If anyone has anything else that you see and want it posted here, email me. I went to Gas’ hometown of Chongzhou a few days ago and got some photos while I was there. Lots of really nice stuff there and a nice town otherwise, worth checking out since it’s about 40 minutes from Chengdu by bus. Mind = blown. 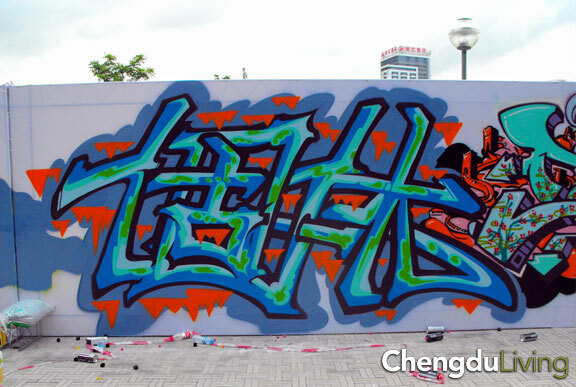 I had no idea Chengdu had graffiti artists like this. Not from what I can tell. 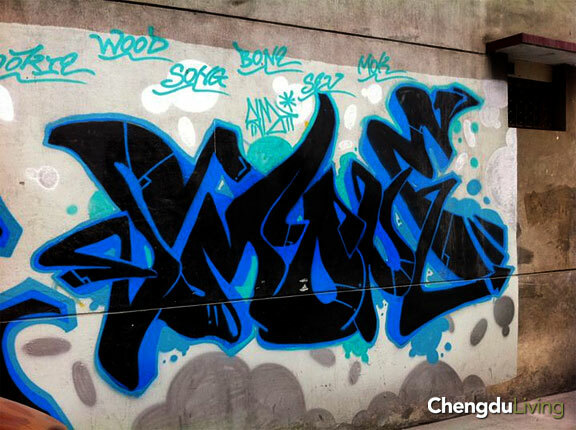 It’s pretty rare to see a tag or piece in Chengdu that’s not made by Gas. He is by far the most prolific writer in the city. There is another guy which Eli mentioned to me but his name escapes me.. maybe he’ll come in here and share that info. I think you can still get Montana’s at 相兵广场 on the ground floor, at the DEF shop. that gray paint on wall/asphalt/sidewalk in the corner of the park is genius. great art, mad skillz, does the Du have a King …..? In the years that I’ve been here there’s been a transient presence at the top.. for years Sack was the most well known respected writer in the city (as far as I could observe) but he didn’t make that much street art and disappeared years ago. Since then Gas has been making art non-stop without pause, it seems. I meant that as a rhetorical question as in, Gas sez no King, but I see a straight soldja gunning for a crown … keep bombing. I second that, it’s a great piece, I also really like that one below it that sort of comes down off the steps onto the street. Good stuff. And a great interview/article – look forward to more. the rest being ‘gas’ and 氣. Nice! If it wasn’t clear, 氣 (qi) is his Chinese tag which means gas. 6, the first character is 長 （the traditional 长）the 2nd one is like 沙,but I’m not sure. A couple corrections after asking Gas. Also, nice work on the translation. Your tone, word choice and syntax all work well to maintain the speaker’s dialect and meaning for a target culture that he was aiming to address. Thanks Reed, high praise coming from you. If you’re interested in participating in an upcoming interview or translation, let me know! Mad Props! As Reed says, the translation is really smooth, I actually wasn’t sure the interview was conducted in Chinese until I read the last paragraph. As an underground art form and distinctive part counter-culture, I was a bit surprised to hear Gas’ praise for the the government. But perhaps graffiti doesn’t hold the same revolutionary reclaiming of public space as it does in the US? It goes without saying that Gas is a really talented artist, and he is bringing beautiful work to the public eye, however I’m curious to see if other graffiti artists are taking things a bit further in terms of counter-culture. I’ve seen “radical” stencils and tags in parts of China, but given the anonymous nature of the art form its hard to seek out answers. Anyone know the Chinese laws on graffiti? In 2009 I met a guy in Jah Bar named Dane Roth, an American college student and recipient of Watson Fellowship. He was traveling around Hong Kong and China on a motorcycle and working on a paper: The Characters on the Wall: Graffiti as a Political Voice in China”. I’d like to see what came of that, but can’t seem to find any articles aside from the mentioning of his project on the Vassar College and Watson Fellowship websites. I talked to Gas today and he was really happy with the positive response to the article. With his work rate, Im sure we will have some more pictures to put up here in the near future. Form and function being at the root of true graffiti style, this guy is pretty impressive. Clean lines, dimension, geometric respect, and clear though in his pieces (I love the two pipes piece) plain to see. 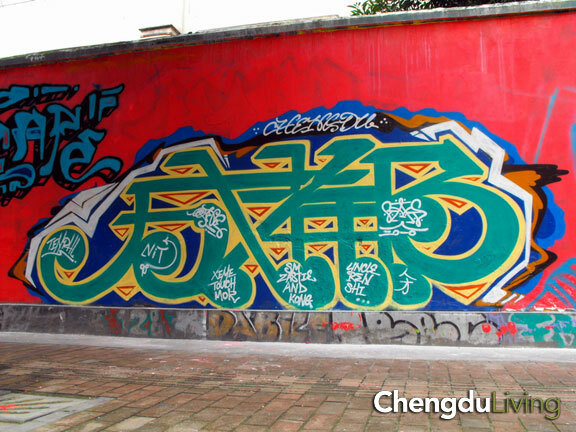 I’ve hunted down and shot graffiti around the world, and was excited to unearth anything with clout in Chengdu. 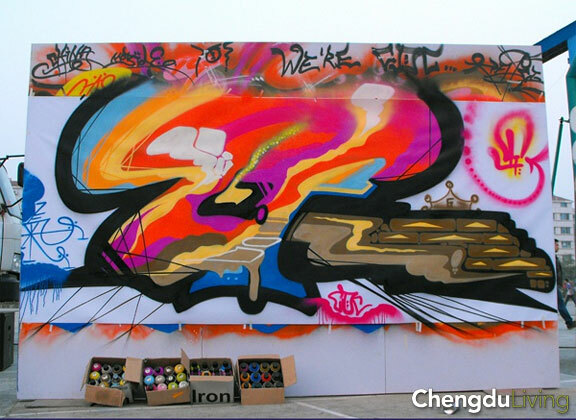 With the influence of artists like Gas, and the ever burdening influence of commercialism in Chengdu, we can all expect to see a rise in counter culture presence in the city. It would be nice to see it come with a fresh perspective, not so bound by the stereo typical roots of Hip Hop culture, which in truth is something completely different today than from the original b-boy era. Even if some homage in style is paid, graffiti and street art have long since transcended this, so it would be interesting to see what might rise up in the next couple of years here. The city is crying out for artists to start vying for space, in contrast to the corporate encroachment in effect. Time to start making stickers me thinks!! If you make stickers, I want to put them up, too. Maybe organize a sticker swap? Where does he get caps in China? Taobao is the best place to get caps. 5yuan a cap or you can get sacks full if you have guanxi with the right folks. Surprised no one has commented on Gas’ last comment about Hu & Wen. I’ve lived in China for years, and have never heard anyone say something like that. I find the Chinese people to be quite “a-political”, so this strong but measured remark at the end really got my attention. I’d be curious to hear that clip or even the whole interview in Chinese. Can our relentlessly generous friends at Chengdu Living let us hear the real Gas? I got the metaphor, though I think most people reading this are more interested in the art itself. Again, this guy has clearly looked closely at what others before him have done, and taken his own style from it. Really nice work, and article. @ Seabass I did comment on Gas’s “shout-out “to the Hu Jintao and Wen Jiabao. I have several Chinese friends in the hip-hop and art scene and haven’t heard them praise leaders in such a fashion. Perhaps it was Gas’ way to mess with the predominant ex-pat community that reads this site and may be critical of CCP policies. I guess the same argument goes that although punk rock comes from political roots it that mean all mohawked kids are activists. Wen is a total actor. We call him “影帝”，which means “the best actor”. If he’s acting, he is damn good at it. I remember everyone catapulting Wen Jiabao to God-like status when he came to Sichuan and delivered that tearful message after the 5.12 earthquake. I added five more photos to the bottom of the post. Very nice looking pieces! 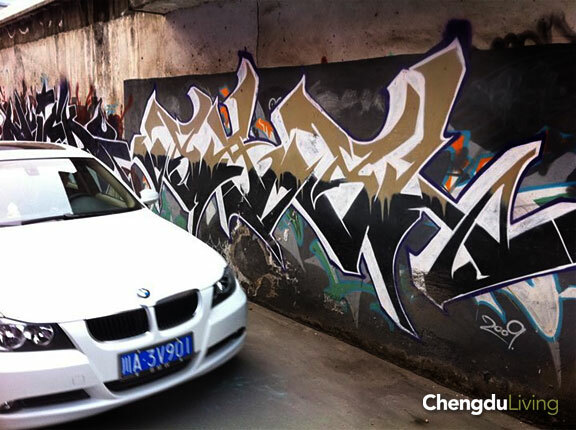 Does anyone know the regulations in china concerning graffiti ? (Sentence, fine ?) What i found peculiar is that GAS has a weblog and is linking his name to his artwork. I guess there are no ppl checking the web to find graffiti artist who did illegal spots ? In Holland nobody links his name to a certain piece and phones are being tapped by the cops aswell. @ Ye Ming yup. western graffiti artists are concerned with anonymity. The police, state, and judicial systems make a handsome profit prosecuting these “illegal acts of vandalism”. I recently watched Banksy’s Exit Through the Gift Shop, which had me thinking about how some elements of grafitti have really moved into the limelight and earned have a strong foothold in pop-culture rather than the underground. Surprised no one has brought up the ubiquitous “phone number” tags in China! A few days ago I got the chance to visit Gas’ hometown of Chongzhou, about 40 minutes outside Chengdu. I came back with some photos which I posted above in a second addition. 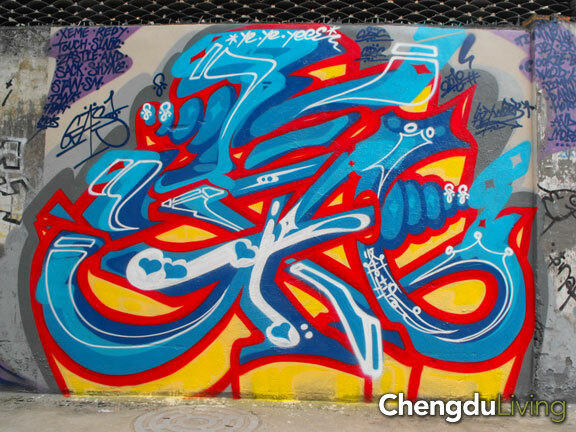 There’s some super nice art in Chongzhou, and this one place that is like graffiti alley! You can see a BMW driving through it in one of the photos above. dose the graffiti on the wall of my high school(located in hongxing road) was made by him? Found this on Google and I’m glad I did. I’m opening a bar and am Looking for Gas to do some work on the interior. Charlie or Eli, or anyone who knows how to reach this dude, please get me his number so I can contact him with a job. I’ll get in touch with him and send his number to you via email after making sure it’s cool with him. 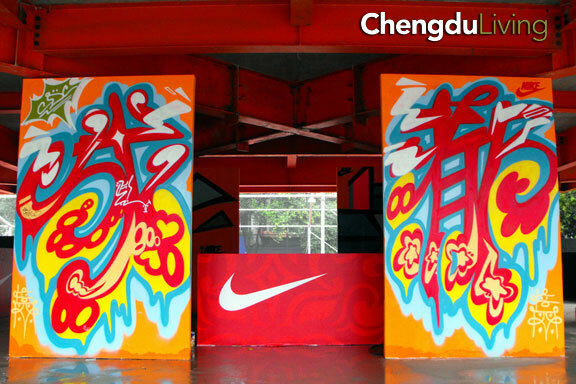 Where’s your bar located in Chengdu? We are located on the first ring road near the hongwasi stop, in the same building complex as that Swedish cafe Kaffestugen. My wife and I are American, and we hired an American chef, and hoping to be open by May 1st. fascinating interview… The little knowledge of graffiti art I have mainly comes from Banksy and his documentary “Exit Through the Gift Shop”… It was great learning about graffiti from a non-Western perspective, and Gas seems like an interesting and honest guy. Thanks! Thanks Travis. I saw Exit Through the Giftshop recently also (Eli brought it to my attention) and loved it. 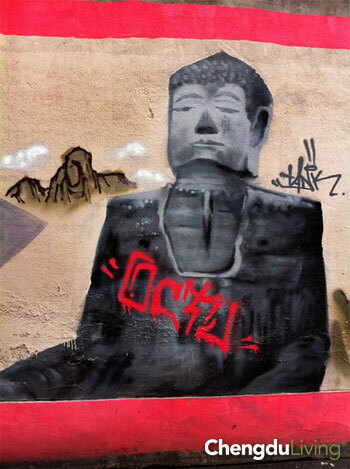 Bansky is an enigmatic subject and it’s a very well made documentary! 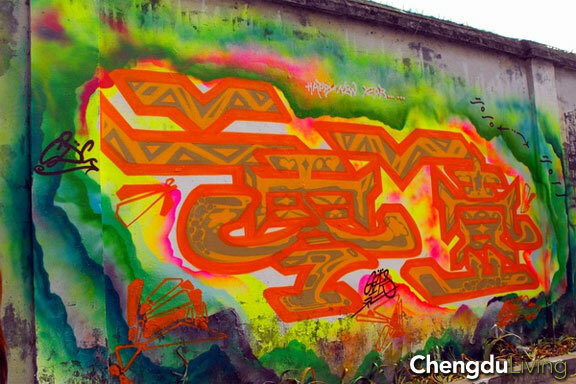 Hopefully someone makes a documentary on graffiti in China, that would be great. There’s some captivating work in here. 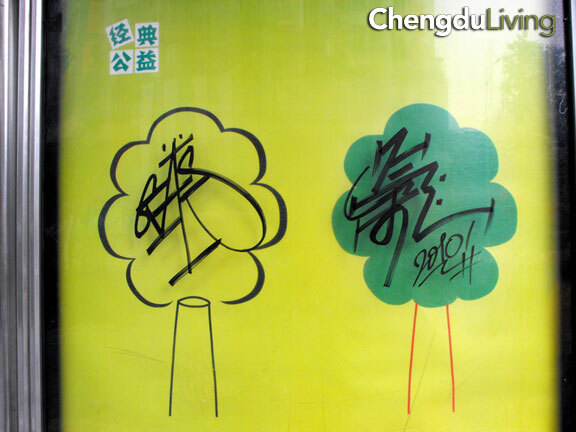 Chinese character graffiti is really beautiful, I don’t understand why it is so uncommon. I know this blog was written a few years ago, so I am hoping someone will see this! 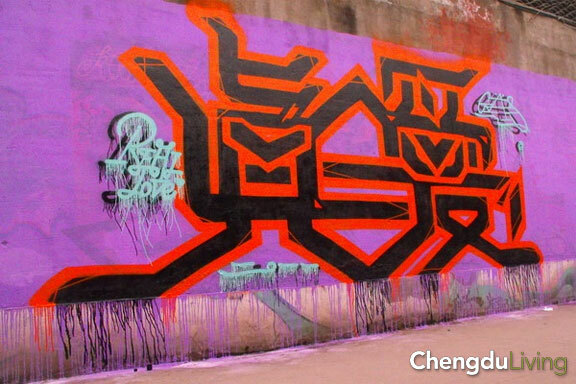 Is there a spray paint store in Chengdu and if so what’s the address or name? Also, are there any legal a walls around the city? Cheers, sick interview and very ill writer, gas. We’re basically all still here! 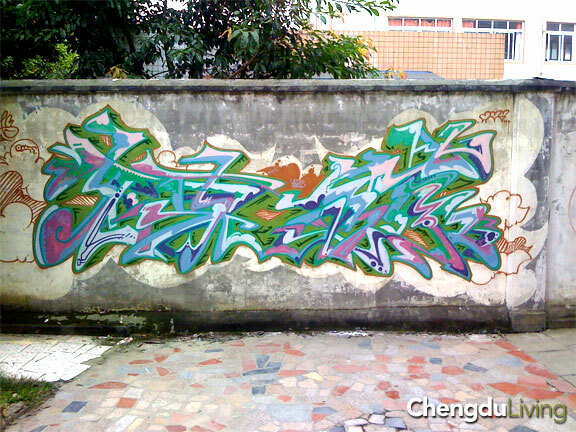 Gas is still living in Chengdu, still doing art. 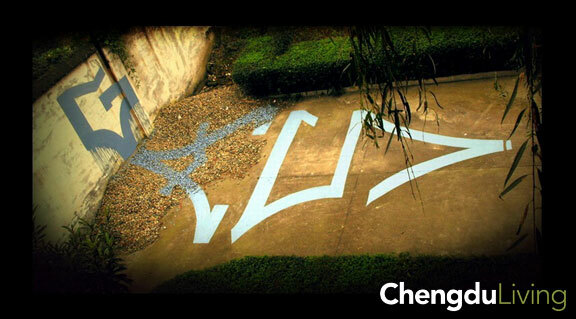 I’m not sure if there are any spray paint stores in Chengdu, but there are places near 春熙路 that sell spray paint. 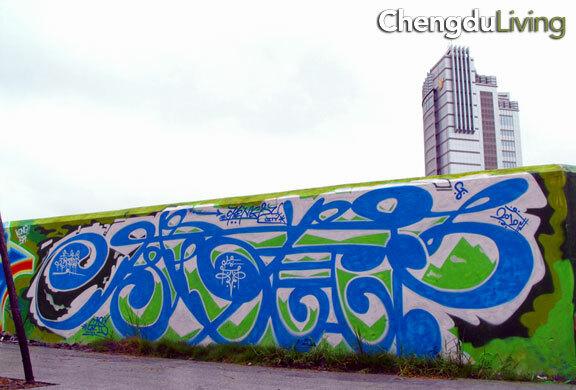 There are no legal walls in Chengdu that I know about or have heard of. Large graffiti pieces in the city aren’t common but you see tags pretty often – usually from only a handful of local street artists. I saw gas in HK – he is a jerk. Too bad. In ten years of knowing him, this is the first time I’ve ever heard of anyone calling him a jerk. Sorry to hear that you got this impression.